Gloucester Rugby Club fly-half Ryan Lamb has been fined £1,000 for punching a student in the face in an attack outside a nightclub in Cheltenham. Lamb, 22, hit Gregor Paterson, 20, from Kent, outside the Subtone club. Mr Paterson told police he shouted that Lamb should be playing for England. Lamb said he had heard different comments of a personal nature. At Cheltenham Magistrates' Court, Lamb admitted common assault over the attack in the early hours on 1 March. 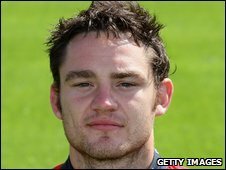 Mr Paterson told police he had said Lamb should be in the England team instead of Andy Goode, prosecutor Theresa Perry said. She also said Lamb heard completely different comments which caused him to become "wound up" and hit Mr Paterson. Defending, Paul Whitcliffe said Lamb was upset at being left out of Gloucester's first team on a few occasions. In a statement, the club said: "Gloucester Rugby can confirm Ryan Lamb has pleaded guilty to a charge of common assault and has been fined £1,000. "Gloucester Rugby regards this as a very serious incident and is already undertaking an internal disciplinary process. The club will not be making any further comment."